Kain, Donna and Elizabeth Wardle. “Building Context: Using Activity Theory to Teach About Genre in Multi-Major Professional Communication Courses.” Technical Communication Quarterly 14 2 (2005). 113-139. Print. o Review of literature that highlights the difficulty of teaching genre in tech/prof comm.. classes. o Review of the ways that AT has been used to understand the function of genre. o Description of the courses wherein the authors taught professional genres using AT as a analytical method. o Discussion of the results of their study which suggest that the use of AT may help students develop sophisticated analyses of first on activities and then next on texts. o Conclusion: highlights the benefits and constraints of AT to teach genre and promote learning transfer from university to workplace. The authors note that the real time demands for textual production in work environments tend to be much more “dynamic, fluid, and collaborative” than the classroom contexts that students inhabit (113). While some universities have instituted WAC/WID initiatives to create real-life exigencies for writing in specific contexts other institutions still have prof/tech comm. classes as service courses. The authors refer to these classes as “multi-major” or “multi-profession” communication classes. The function of genre: the forms of life and frames for social action that communicate to reinforce communal identity, legitimate situated communication practices, and help individual members of a community structure their knowledge in order to create, interpret and use information (115). The authors identify two problems that constrain classroom instruction with respect to genre: 1) mismatches between university and workplace expectations and ways of learning; and 2) inability for students to transfer what they learn in academic settings to workplace settings (115). The disconnects draw attention to the expectations of individuals: in school settings students report knowledge. . . in the workplace they are expected to persuade using knowledge. The school-based writing results in specific attention to form. This isn’t the primary quality in workplace environments – form is important but rhetorical persuasiveness is even moreso. 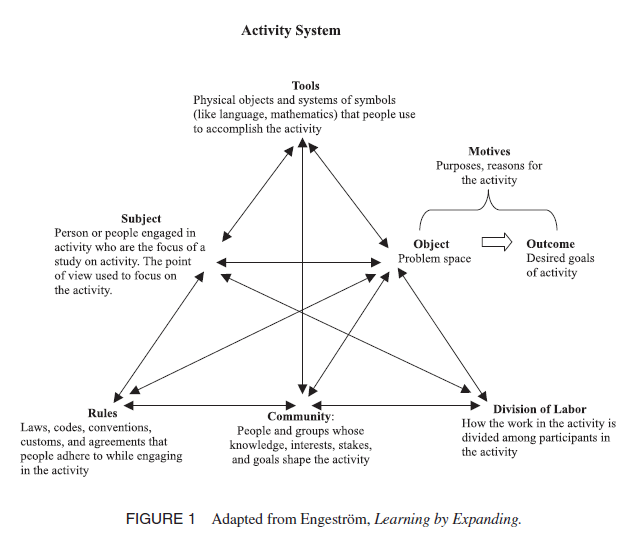 What is the “social basis” of an activity system? “The rules [formal requirements, informal habits of work, and shared conventions of a group. Rules also include language use, grammar, syntax, form, structure, style, and format], community [group from which the subjects take their cues and to which they contribute], and division of labor [the distribution of tasks and knowledge across the system] . . . that situate the activity in a broader context and allows us to account for historicity and diversity in the activity (121). The authors draw out the relationship between genre and activity by beginning with Miller and moving through various folks in rhetorical genre studies (Duin and Hanse, Bakhtin, Bazerman, Smart, and Berkenkotter and Huckin) (121-2). What’s the point of AT? “by examining the relationships and interactions among subjects, tools, and motives and the ways that the social basis of the system shapes indivisual actions, we can better understand how individuals perceive activity and operate in contexts and explain why individuals are motivated to learn and use particular tools. We can also evaluate when and why elements of activity systems conflict, causing what activity theorists call contradictions or failures in activity that interfere with realization of individuals’ and communities’ goals” (122). 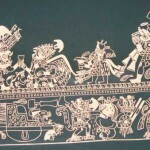 o Genre conventions and structures serve specific purposes in activities and are often required – in other words, contexts bring to bear heavily on the generic conventions of documents. o Genres are only ever stabilized-for-now and change as activities change – An important recognition as this reinforced the contextual and contingent nature of genre while also drawing attention to the uselessness of teaching standard formats. o Genres are shaped by the history of the activity system – Recognition of the historicity of workplace tools allows students to recognize that writing in the workplace isn’t about conforming to rules; rather, it is about being effective and rhetorical. o Genres are the result of man interconnected influences within and outside activity systems – This leads to a recognition of “genre systems” (Bazerman)(130). o Genres have different value for different community members and reflect divisions of labor – This emphasizes the notion that there are many different stakeholders that have motives and interests bound up in workplace writing. This is different from teacher-student writing exercises that typify many writing/lit classes. o Genres are created and used by many people, but individuals and communities express multiple (and sometimes competing) motives for using the same genre – This goes a long way in disrupting the Romantic conception of the author (and the attendant Romantic reader). This also has implications for copyright/intellectual property. o Genres anticipate responses related to activity – genres elicit responses. A key component of making this assignment effective and successful was combining observational work with direct interviews.